This Earth and Sky' Pinot Noir is beautifully perfumed and seductive, the bouquet shows mature fruit, mixed spice, cedar, truffle and violet characters with a hint of dried herb complexity. Totally delectable. The wine has a nice purple colour with purple hues. 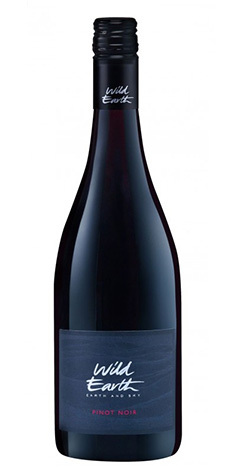 Perfumed dark cherry and plum fruit on the nose with spice, leather and chocolate, together with a hint of char. Rich and concentrated flavours of dark fruit with hints of spice, leather and coffee along with some toasty oak on the palate. A complex, structural wine with ample fine-grained tannins and a long, lingering finish. The fruit (Pinot Noir clones 777 & 10/5) comes from Bannockburn vineyards and wash and harvested on 13 & 19 April 2012 respectively. The fruit was destemmed into two stainless steel tanks to undergo a period of cold soak, before being inoculated with selected wine yeasts to carry out the fermentation. The wine was aged in French oak barriques for approximately 16 months, of which 34% was new oak. This wine is comprised of a 50/50 blend of the two best lots.